Are you looking for great relaxation spa ideas or homemade recipes? As long as you have access to a clean bath tub and a few natural ingredients and kitchen items, relaxation is within reach. This page contains two homemade bath products that will help relieve anxiety and make you smell great! For those who enjoy creating homemade spa products, click here to learn the secrets to selling them for a profit. Are you feeling anxious, stressed out or do you have trouble falling asleep? Here is a bath product recipe that should help you. 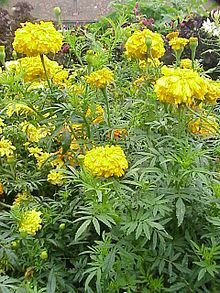 You will need access to a marigold plant (Tagetes erecta). Please note that Calendula officinalis won’t work. You’ll also need a large pot, warm water, a strainer… and a tub! Soak all ingredients in a large pot filled with warm water for 60 minutes. Squeeze the ingredients with your hands to release their essential oil in the water. Pour yourself a warm bath (but not too hot!). Pour your bath mixture through a strainer and mix with your bath water. Relax and soak in the tub for 30 minutes. Breathe deeply and let the essential oils work their aromatherapy magic on you! For this relaxation spa treatment recipe, you’ll also need a mortar and pestle, a large bowl, a small bowl and a kettle. Pound the almonds with a mortar and pestle. Transfer to a small bowl for now. Pound the rose petals with a mortar and pestle. Transfer the rose petals into a large bowl and add the boiling water and soap flakes. Stir until smooth. If your mixture starts to solidify, create a double-boiler arrangement, where your bowl can be heated over a large pot of boiling water. Add the rose water and ground almonds and stir. Let the mixture cool. Stir in the essential oil. Split your mixture into 6 balls. Shape as you see fit and let your soap bars harden in a cool, dark place, between layers of wax paper. You should wait until your soap is hard before using it as hard soap lasts longer. Enjoy your homemade soap bars in the shower or bath, or give them away to friends and family! Making body scrub exfoliating products. Manicure, pedicure, facial and other relaxation spa treatments.